On your way to Boranup Galleries, you will drive through the awe-inspiring Boranup Forest. Boranup Forest within the Leeuwin-Naturaliste National Park, lies between Caves rd and the coast and creates a powerful contrast with the rest of the coastline. The stunning trees that dominate the slopes and valleys line the roadside and make a truly enjoyable scenic drive. Now all 120-year regrowth, the forest was originally milled during the late 1800s timber boom. What makes this point significant is the sheer size of these regrowth timbers, and one can only imagine the size of the giant karris that once grew along this ridge before taken by the original timber mills of the area. Scenic pull-off areas along the road make for great photo opportunities. 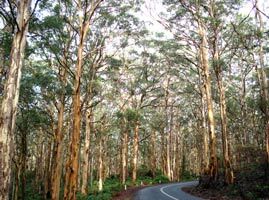 The forest is home to the pale-barked Karri Trees (third tallest trees in the world) that reach heights of 60m or more. Boranup is an Aboriginal word that means “place of the male dingo” and the forest lies in the land of the Wardandi (people of the Warden, the ocean spirit) one of the fourteen Nyungar tribes that live in the State’s South-West. The Wardandi tribe’s land extends from the coast at Stratham to the sea at Augusta. Visitors to Western Australia are often struck by the number of place names ending in “up” such as Cowaramup, Boyanup, Nannup, Yallingup and Balingup. The “up” in these names comes from the Aboriginal Noongar language but there is some dissension as to whether it means place of, water place or meeting place and most likely it is a combination of all three translations. Maurice Coleman Davies was first granted land in the Boranup Forest in 1882 to establish timber mills. Given a 42 year lease, M.C. Davies established the Karridale Mill in 1884, becoming the most advanced saw mill in the colony. In 1891, a new steam mill was commissioned at Boranup, but was destroyed by fire a few years later. 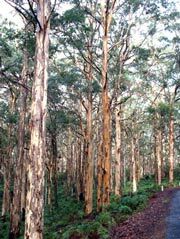 Two thirds of the land in the forest consists of Jarrah and Marri trees with the remainder being Karri.